The Giant Metrewave Radio Telescope (GMRT) was used to survey the radio sky at 150 MHz between 2010 and 2012. To date, the data collected by the TIFR GMRT Sky Survey (TGSS) project team remained largely unpublished within the scope of that project. We independently reprocessed the TGSS data using the SPAM pipeline, which includes corrections for direction-dependent ionospheric phase effects. Our first alternative data release (ADR1) includes continuum stokes I images of 99.5 percent of the radio sky north of -53° DEC (3.6π sr, or 90 percent of the full sky) at a resolution of 25“ x 25” north of 19° DEC and 25“ x 25” / cos(DEC-19°) south of 19°, and a median noise of 3.5 mJy/beam. The extracted radio source catalog contains positions, flux densities, sizes and more for 0.62 Million sources down to a 7-sigma peak-to-noise threshold. The data processing and products are described in detail in Intema et al. (2017). The TGSS-NVSS spectral index data release page is found here. News will be posted here and on our Facebook page. 22-Aug-2018: Since 1-2 weeks there have been some issues with the VO server where TGSS ADR is hosted. As a result, also NASA SkyView has not been working correctly for TGSS ADR. Please know that the problem is being addressed, and SkyView is expected to properly work again in a matter of days. 01-Dec-2017: A special version of TGSS ADR1 has been combined with NVSS to create a spectral index map and catalog of approx. 80 percent of the radio sky. The public data release page is found here. 15-Nov-2016: The TGSS-based LOFAR Sky Model Creator now has a flux cutoff option to exclude sources below a certain threshold. This can be used to speed up the initial calibration by using fewer model sources. 11-Jul-2016: TGSS ADR is added to SkyView under Radio:MHz (thanks Tom McGlynn). 06-Jul-2016: Added a LOFAR GSM generator here based on the TGSS ADR1 source catalog. 20-Jun-2016: The TGSS second Alternative Data Release (ADR2) is planned for late summer 2016. This release will fix some of the issues in ADR1 described in Known problems and fixes. 20-Jun-2016: Added a page on Known problems and fixes. Please check it out before using the TGSS ADR1 data products. 04-Apr-2016: Updated paper to reflect latest changes in source catalog. 31-Mar-2016: Removed Google+ page (impossible to work with ). 23-Mar-2016: Added HiPS version of source catalog for faster interactive exploration! 23-Mar-2016: Changed the catalog merging strategy to minimize double source entries. Changed formatting and units in table to match the sample table in the paper. Updated downloadable catalogs. VO server will be updated soon. 17-Mar-2016: FITS header problem found in VO images, causing beam size problems (thanks Blazej!). Now fixed. 17-Mar-2016: Added TGSS mosaic/pointing grid coordinates file under Survey Products. 16-Mar-2016: Added a cautionary note on the use of the source catalog. 16-Mar-2016: Updated source numbers on webpage and in paper. Changed local links to updated paper until arXiv version is updated. 16-Mar-2016: Removed some double entries from the source catalog. Updated catalogs (0.63 Million sources) are available for direct download from this webpage. VO server updated. 15-Mar-2016: TGSS ADR1 data release goes live online. 15-Mar-2016: TGSS ADR1 paper submitted. Pre-print available via arXiv. TGSSADR Image Archive containing 5336 mosaic images of 5×5 square degrees covering the survey area. TGSSADR Image Cutout Service provides cutout images of up to 1×1 square degrees anywhere in the survey area. TGSSADR Source Catalogue provides access to the 0.63 Million radio source catalog extracted from the full survey area. The 5×5 square degree mosaic images that form the basis of TGSS ADR1 are available for direct download here (5336 FITS images; 32 MB each). Note that there is a factor 3.6(!) redundancy in the sky coverage, mainly to guarantee up to 1×1 square degree cutouts anywhere in the survey area. A NOTE OF CAUTION: The source extraction and catalog merging is a very complex operation. Certain choices were made that have an impact on the characteristics of the final catalog. A source catalog can be used to quickly make selections based on the average properties of sources, but may not give the desired answer for individual sources. Especially for (strongly) resolved sources, it is advised to inspect the image(s). The interactive tools presented below are a convenient way to do that, but there are also other options (DS9, TOPCAT, etc.). Here is the github link to a python script written by Aayush Saxena (Leiden) that uses PyVO to get image cutouts. The TGSS ADR survey images and catalog are available as a Hierarchical Progressive Survey (HiPS), which allows you to efficiently inspect the whole survey area interactively. With powerful tools such as Aladin you can quickly search for your favorite object(s), and combine TGSS ADR images with many other astronomy (survey) images and catalogs, either available online through CDS and other resources or from your local disk. Here are three ways to use Aladin to access the TGSS ADR HiPS. For options 2 and 3, make sure you have java installed and enabled. Alternatively, http://tgssadr.strw.leidenuniv.nl/catalogs/TGSSADR1_7sigma_catalog.fits to load the TGSS ADR catalog, but this may slow down the Aladin display significantly. Note: When using the Aladin Desktop tool, it keeps a local cache (under $HOME/.aladin/Cache). Occaisionally we will make changes to the HiPS images or catalog, which we will announce in the news section and on Facebook. For this to work, the local Aladin disk cache needs to be cleared. In Aladin, this can be done under Edit→User Preferences. Created by Alex Mechev and Josh Albert (Leiden). NOTE THAT DUE TO A SERVER SOFTWARE UPGRADE THE NAME RESOLVE CURRENTLY DOES NOT WORK. ENTERING DIRECT RA,DEC COORDINATES DOES WORK. Example: Abell 1234 or 3c123 or 0.12,-34.5 or Cas A. This figure is a Mollweide projection in equatorial coordinates showing the sky coverage and the distribution of the background RMS noise for the TGSS ADR1. The median RMS noise is 3.5 mJy/beam. The noise is higher in the Galactic plane, at low declinations (due to lower elevation angles of the telescopes), and around bright radio sources at this frequency such as Cas A, Cen A, and Cyg A. This plot shows the superiority of TGSS ADR in terms of the angular resolution and RMS sensitivity with respect to other wide-field surveys at similar frequencies. Wide-field centimeter wavelength surveys are also shown for comparison. Red symbols indicate meter wavelength surveys (<300 MHz), while blue and green symbols are existing and planned centimeter surveys (>300 MHz), respectively. Lines of constant surface brightness are shown in gray for a surface brightness sensitivity calculated as a function of resolution for 3 x RMS noise. We are very interested in receiving feedback from users of the TGSS ADR survey products. We aim to improve the quality of the survey products where needed, but will need your help with that. So please report any problems that you find. We're also interested to hear about positive experiences and cool science that was enabled by using the TGSS ADR survey products. An OH(1720 MHz) Maser and a Nonthermal Radio Source in Sgr B2(M): An SNR-Molecular Cloud Interaction Site? If you are using the TGSS ADR survey products for your research, that's great! Please acknowledge our service to the astronomical community by adding this reference (Intema et al. 2017, A&A, 598, A78) in your publication. Please also add the standard GMRT acknowledgement: We thank the staff of the GMRT that made these observations possible. 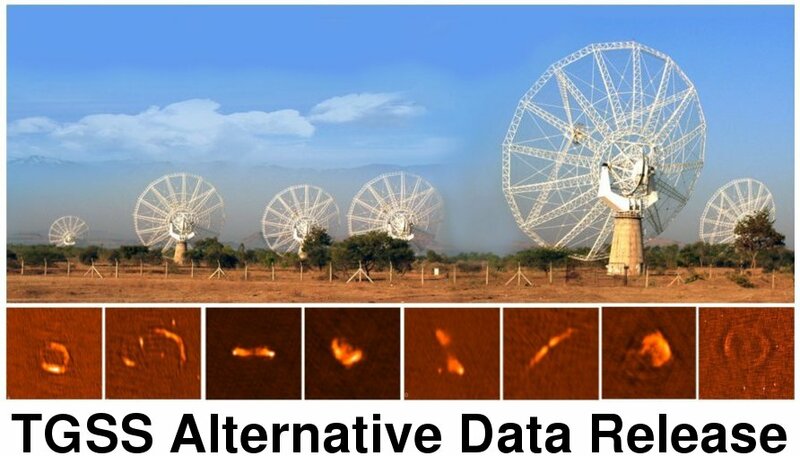 GMRT is run by the National Centre for Radio Astrophysics of the Tata Institute of Fundamental Research. If you use one of the Aladin tools to access TGSS ADR for your research, please refer to these papers (2000A&AS..143...33B and 2014ASPC..485..277B) and add this acknowledgement: This research has made use of “Aladin sky atlas” developed at CDS, Strasbourg Observatory, France.